Mikhail Khvitia (1924 - 1994) graduated from Tbilisi Art Academy (1942-1948) under the direction of Professor Alexandre Tsimakuridze, who is considered to be the first distinguished landscape artist. 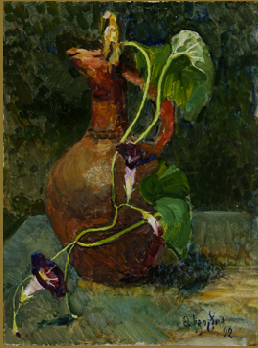 Mikheil’s collection of paintings is also dominated by landscapes of Georgia’s nature at different times of the day, weather and seasons. He has visited every corner of the county of Georgia, clearly evident within his paintings – “Borjomi Valley,” “Autumn in Raja,” “Maple Trees in Kartli” and many more. The paintings of his home region Samegrelo are especially distinguished within his body of work. Starting in 1949 through the conclusion of his life, Mikhail actively exhibited within his home country, as well as internationally. His works belong to the National Art Museum of Georgia, Museum of Eastern Arts in Moscow and other galleries. He is a part of the Georgian Encyclopedia (Part XI) and the Glossary of the Soviet Arts (printed in Moscow since 1965). 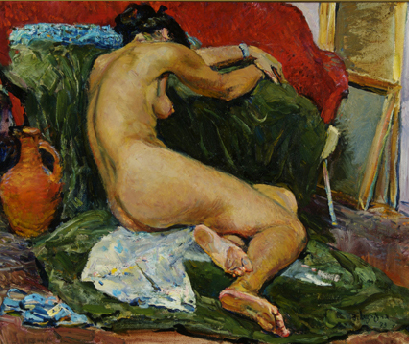 Eleven of Mikheil’s oils on canvas created between 1950 and 1970 belong to the National Art Museum of Georgia. One of them is “Eucalyptuses” (1952) part of his earlier works with its delicate technique and translucent colors. Grey-green and lily color scheme is abundant in his early period works. The collection also includes landscapes from all corners of the country: “Kakheti,” “Bakuriani,” “White Mountains of Imereti…” His later works are dominated by rich and bold color and hue selection. Several of his paintings are notable with such a description - “Hay Stacks,” “Autumn,” “Tbilisi” –which are predominantly expressed through deep red, yellow, brown and greens. Mikheil’s paintings portray certain lyricism and romanticism within. They express nature and the environment so intertwined with feeling and emotions. Mikhail Khvitia was an honored artist of country of Georgia. 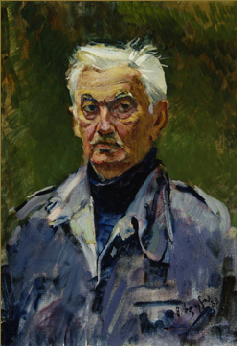 Harking in 1949 through the condition of his life, Mikhail exhibited in his home country and internationally. His workes belong to the National Museum of Georgia, Museum of Modern Art of Georgia, Tretiakov Gallery and Museum of Eastern Arts in Moscow, as well as other galleries. Mikhail Khviria played an important role in development of the landscape painting. His paintings are dear to everyone. The subjects and motifs of his works are lyrical, sometimes idyllic, sometimes full of romance and always original, with different type of beauty and full of magic color.